The case of a young Michigan girl strangled to death in a vertical blind has prompted the recall of about 139,000 custom-made vertical window blinds and 315,000 horizontal products. The Consumer Product Safety Commission (CPSC), in cooperation with Blind Xpress of Livonia, Michigan, announced the recall on September 6. The two-year-old girl from Commerce Township was reportedly strangled in the hanging loop of a Blind Xpress vertical blind cord in 2009. The CPSC is recalling the defective window blinds because the design makes it easy for children to become entangled in the cord loop. Part of the problem is the custom vertical blind cords do not have a cord-tensioning device that attaches to the wall or floor. The horizontal blinds do not have inner cord stop devices. The recall involves Blind Xpress blinds sold in specialty stores in Michigan, Ohio and Indiana from January 1995 through December 2011. The defective blinds were manufactured in the United States. The CPSC urges consumers to immediately stop using the window blinds and contact the Window Covering Safety Council for a free repair kit. The toll-free number is 800-506-4636. According to CPSC data, were 147 incidents involving children being injured or killed from 2004 to 2010 – or 21 per year. The CPSC, industry and safety groups have made several efforts over the past couple decades, including recall/retrofit programs. The major push came in 2009, when after the death of 16 children, the industry recalled 55 million Roman Shades with exposed inner cords on the back of the shades. The Parents for Windows Blind Safety, a non-profit organization which advocates for more stringent regulations, says the hazard lies with cords which stretch more than 7 1/4 inches. It proposes the window blind industry sell cordless blinds or those with inaccessible cords. 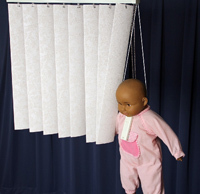 Death of Child Prompts Recall of Window Blinds by Blind Xpress, Consumer Product Safety Commission. The History of Corded Window Covering Recalls, Parents for Window Blind Safety. The Boston product liability lawyers at Breakstone, White & Gluck have over 85 years of experience handling cases involving recalls and defective products causing injury. If you have been injured, learn your rights. For a free legal consultation, contact us today at 800-379-1244 or 617-723-7676 or use our contact form.